UMHA AOIS (BRONZE AGE) - Experimental bronze casting project. 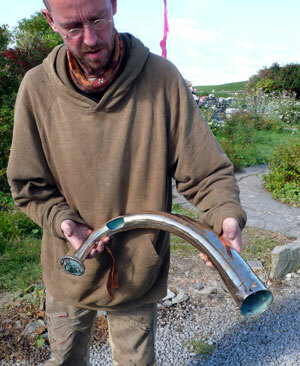 Holger Lonze with his casting of a Bronze Age horn in Doolin Co Clare, Ireland, at the 2010 bronze casting symposium, Umha Aois. 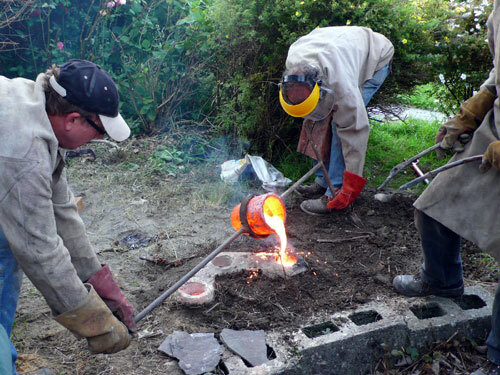 I attended the nine day Umha Aois (Irish for Bronze Age and pronounced Oova Ish) Bronze Casting Symposium in Doolin, County Clare, on the west coast of Ireland. It is a real hands-on event and has been held annually for several years. 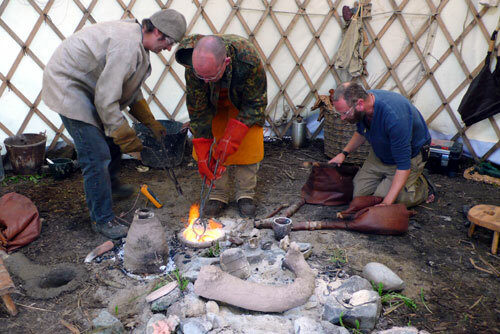 * The aim of the project is to understand more fully, how Bronze Age metal working was carried out, by attempting to reproduce items for which there is artefactual evidence, using, as far as possible, methods for which there is archaeological evidence. There is also a certain experimental aspect, looking at methods which could have been used and which might not necessarily leave any evidence. Most of those attending were either sculptors, metals specialists or archaeologists, although the project started out originally as an artist/sculptor based event but has gradually become more biased towards the archaeology. The focus of this year’s event was on trying to reproduce some of the magnificent blowing horns dating to the Bronze Age and found in various areas of Ireland. Many examples of horns, either side-blowing or end-blowing, are displayed in the National Museum in Dublin, together with other ritual objects, including crotals, the ovoid, seamless, hollow, bronze objects, known only from the Dowris hoard and thought possibly to be associated with a bull cult. It is thought the horns were made using the lost wax process, but the work involved in making such a wax model, together with its sprue assembly was extremely complex. In its simplest form, the sprue assembly comprises a pouring cup and tubes for the molten bronze, together with risers to allow the hot gasses to escape. Many people will perhaps have experience of using the lost wax method of casting, so I won’t describe the full process here. However, I will say that applying all the runners and risers to a large, hollow, delicate wax object such as a horn requires a lot of skill in assembling it securely, with minimal handling of the whole relatively soft, but heavy wax object. Hollow objects such as socketed items or horns are also more complex because they must have a core, which needs to be held in place by pins or chaplets, as once the wax has been melted out, the core will be loose inside the mould. (Needless to say, as a beginner I did not tackle a horn, but managed to produce a reasonably successful socketed spearhead, a flanged axe and a couple of smaller items). The wax models were dipped in two layers of clay slip, before being built up gradually with layers of clay mixed with horse dung and some grog, until a good thick mould was achieved. The wax was then melted out (and collected for re-use) in two stages. Firstly, over a fire, it was melted from the pouring cup, thus giving an escape route for the wax deeper inside, and preventing sideways expansion which might cause the mould to explode. Further heating of the moulds, placed upside down in a furnace, melted out all the remaining wax. The clay moulds were then fired hard in the furnace. The resultant hollow, fired clay and dung moulds were light and crumbly on the outside and withstood the heat shock of being filled with molten bronze, whilst the inner layers of fine clay slip maintained the fine detail of the original wax model. The smelting and casting was done either in simple pit furnaces inside a wood and canvas yurt or in the open air, in small above-ground, hand-built furnaces which we made from clay and horse dung. 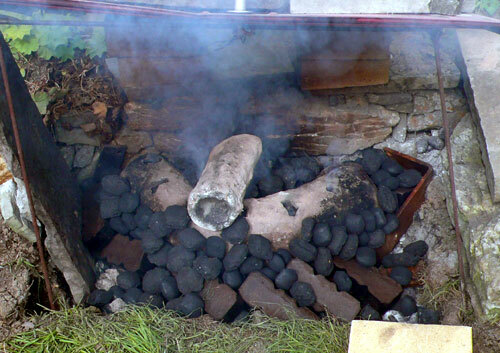 Using lumpwood charcoal, in either of these furnace types, it took surprisingly little time, with the aid of the wood and leather bellows, to achieve a pouring temperature of 1050 – 1070°, which was thought to be suitable for the type of mould being used. During this project, most of the bronze was smelted from 90% copper and 10% tin, although when casting a Medieval style bronze hand bell, 20% tin was used, to achieve a better ring tone and it did indeed give a beautiful sound. About six attempts were made to cast a horn, but only one was really successful and there is more work to be done on refining the method. 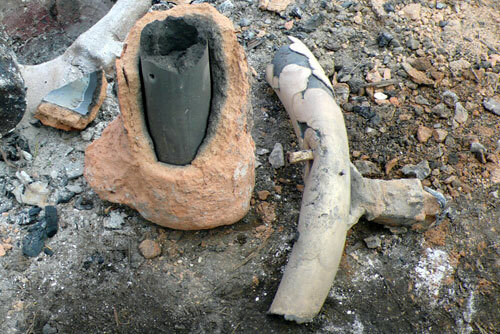 It seems that casting with the mould supported in the ground in an almost upright position and with a single pouring cup, thus giving better pressure to the flow of molten bronze, might be better than placing the mould horizontally and having multiple pouring cups. However, there are so many variables that this cannot be stated with certainty. The successful casting was of a side-blowing horn, which had the typical decoration of small conical spikes around the open end, and a small loop close to the closed end. It is thought that the original horns were probably made specifically for individual persons, as the gap at the narrow end was nearly always about a hand width, allowing for comfortable holding when being blown. The successfully cast horn made a very good sound and was relatively easy to blow, using closed, vibrating lips. The bullocks in the next field were intensely interested whenever the horn was blown! 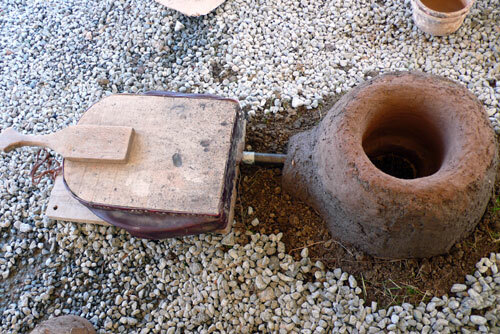 Above-ground furnace made fron clay and horse dung, used with large bellows. 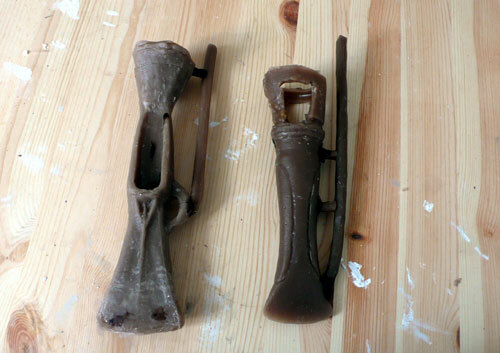 Wax models of a flanged axe and a socketed axe, with partially completed sprue assembly. Various wax models and their sprue assemblies drying after their first coat of clay slip, ie the first stage of mould making. Melting out the wax from a completed horn mould and an axe mould. Melting bronze in a pit furnace, to pur into a bell mould. A horn mould also lies in the foreground. Pouring a horizontal horn mould, made with three pouring cups. 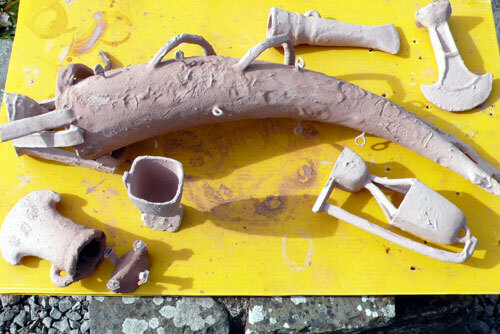 An unsuccesful horn where the bronze has not poured into the wide end of the clay mould. The clay core can be seen in the unused part of the mould.